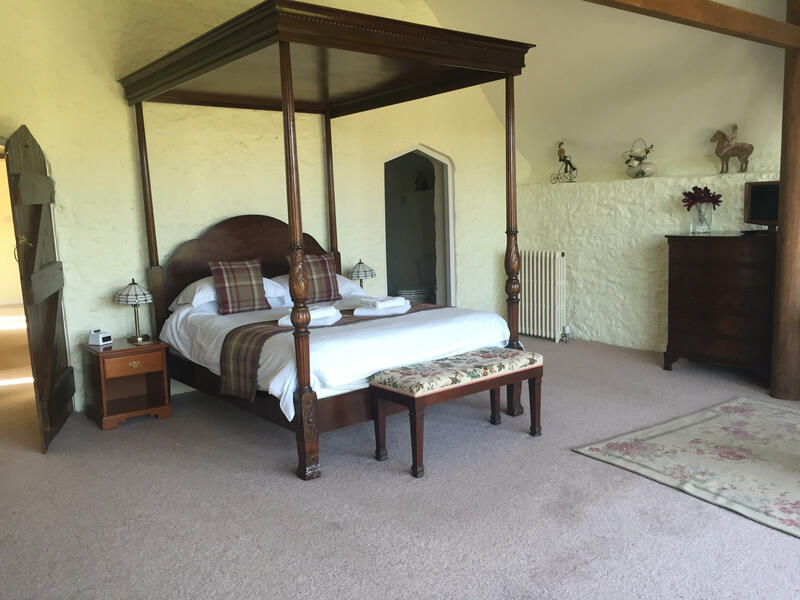 The stone barn was built in 1482 Century and recently restored to original thatch. 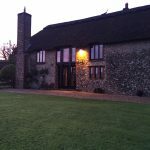 It is situated on the site of a mediaeval monastery. 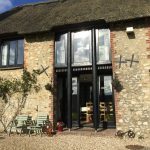 The property has benefited from recent refurbishment and now combines a modern taste in furnishings and open plan airy living, whilst being warm and cosy. 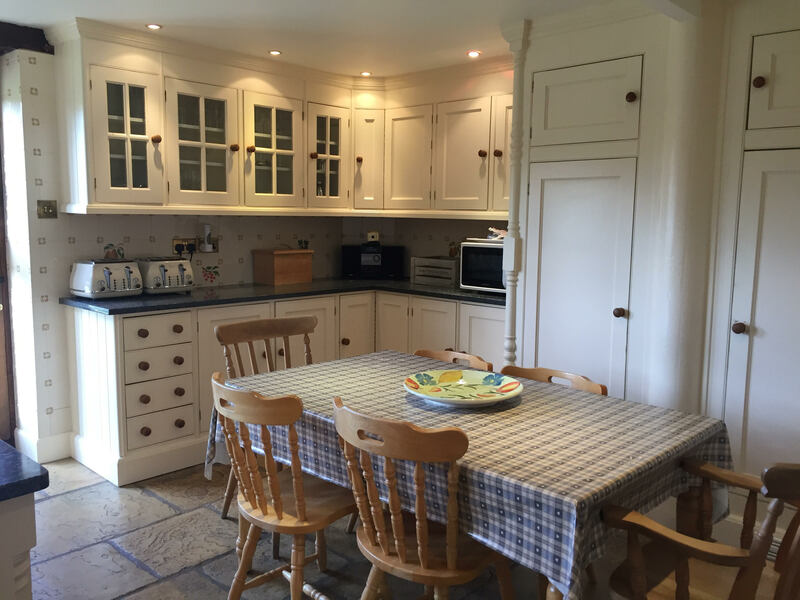 >> Click for more details. 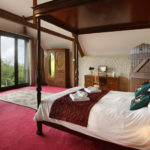 The large farmhouse was part of the original prosperous farm that was built to provide food for the local community and small medieval monastery that was also onsite the property is tastefully decorated and recently refurbished to offer a combination of modern boutique and medieval charm. 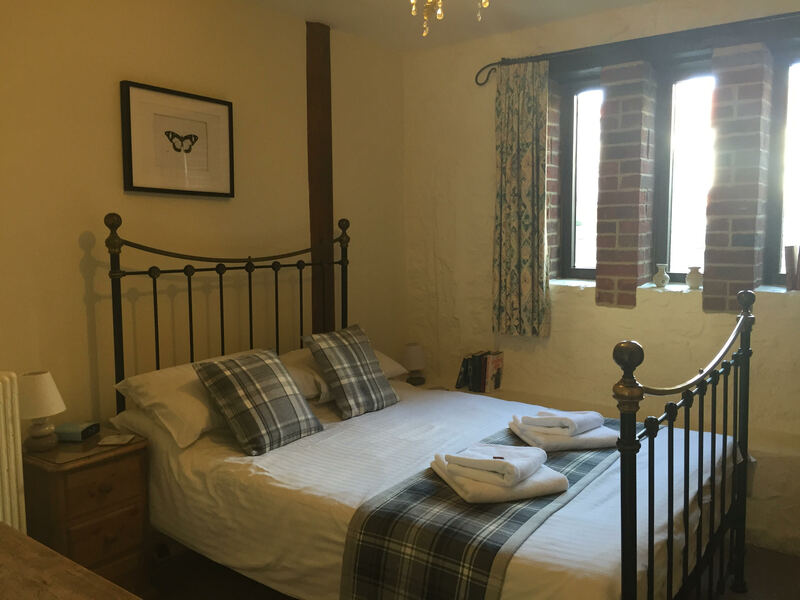 The smaller, single-storey cottages at Champernhayes have been created from the conversion of the original farmhouse buildings, which date back to 1482, Blackbird cottage is the largest cottage that are , grouped around a central courtyard, have been awarded 5 stars by the Tourist Board, their highest grade for comfort, location, décor and facilities. 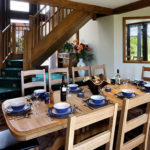 Owl hosts x 4 guests has been recently been refurbished. 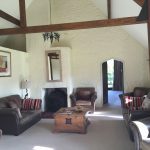 It has an open plan split- level. 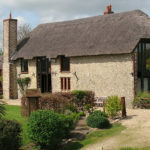 Luxury cottage with 2 bedrooms and cosy coal burning stove- sleeps 4. 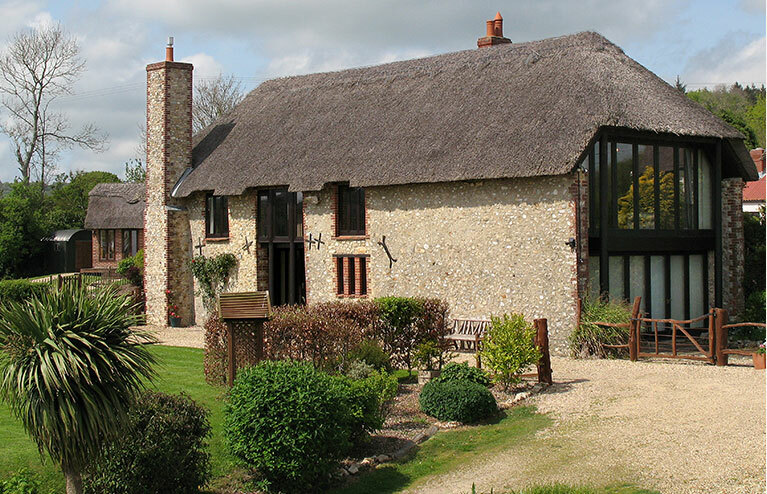 Delightful little cottage – perfect for a couple and those holidaying on their own- sleeping 2. 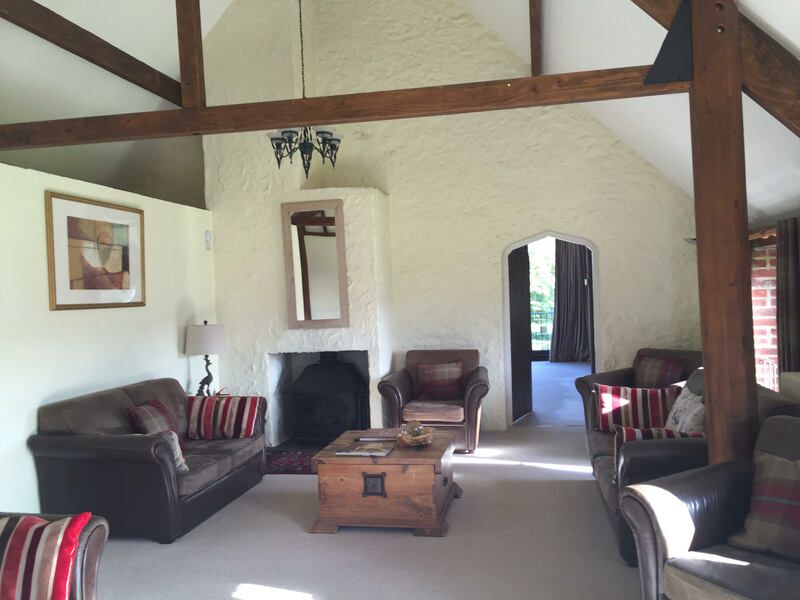 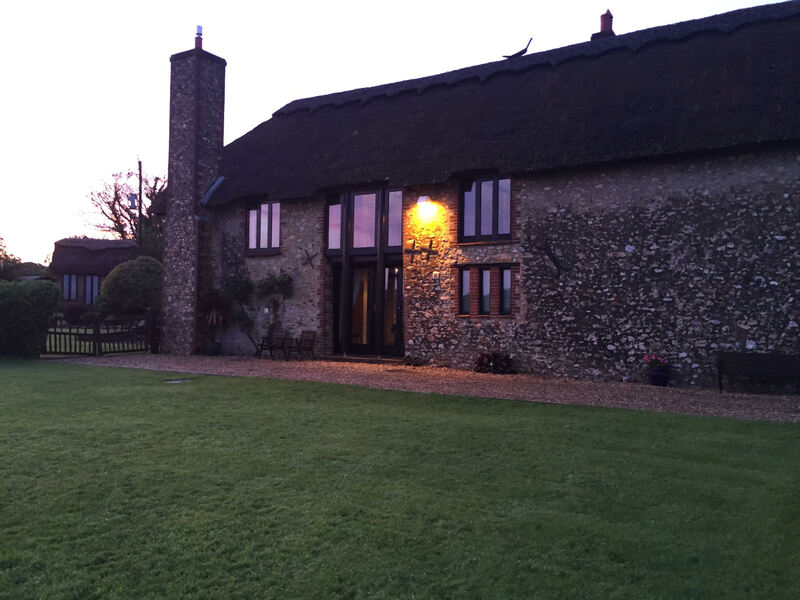 The Barn conversion sleeping 10/12 and is ideal for large groups and celebrations. 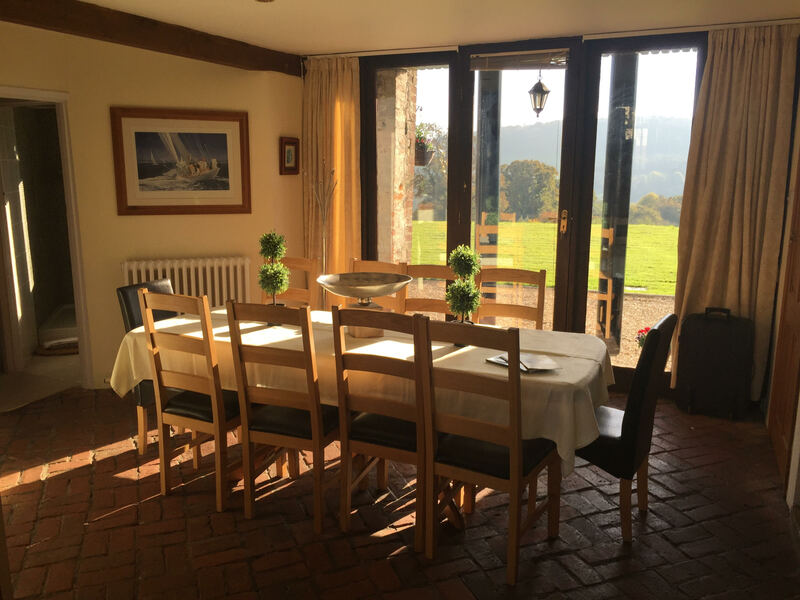 From the large hall, and up the wide wooden stairs, you will find the impressive bright airy first floor sitting room with exposed A-Frame beams, large log burner and spectacular southerly views across the valley to the sea at Charmouth. 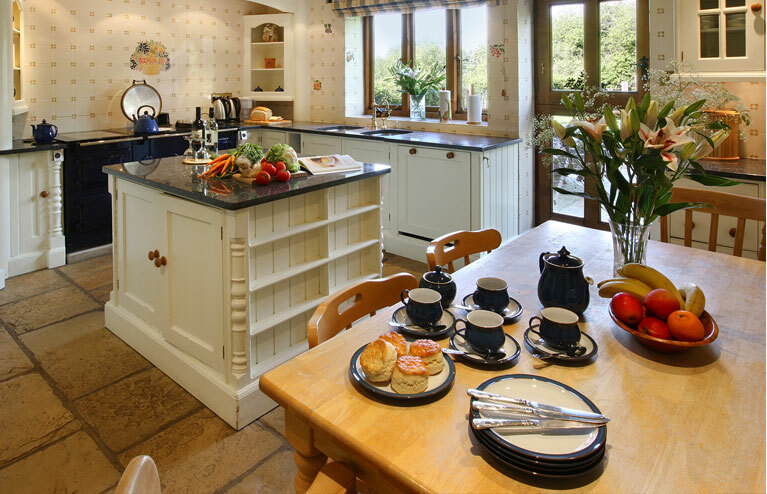 There is large hand built modern oak and granite topped kitchen that is well equipped. 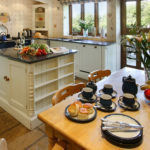 An unusually large four oven Aga is the heart of the kitchen, stable doors overlook the private garden that was the site of the medieval monastery and whose footings can be seen on the stone wall. 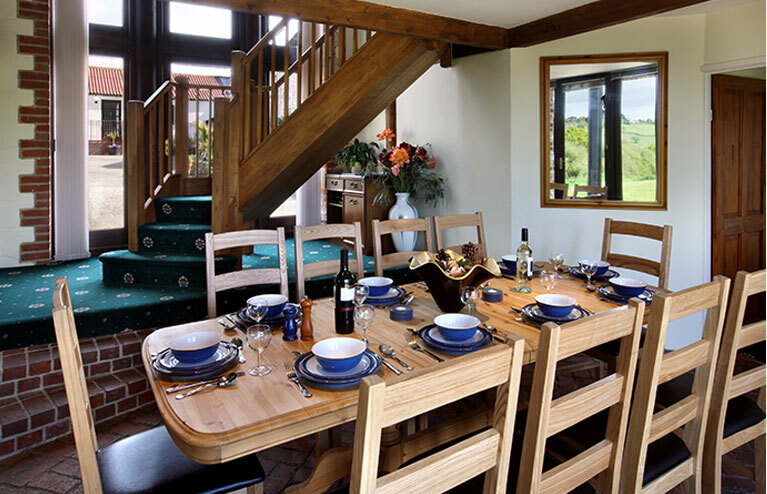 Breakfast can be eaten at the large oak breakfast table. 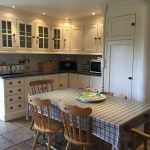 Everything that is required to cook & host a large family dinner including dishwasher, Washing Machine (utility room) Tumble Dryer, Microwave, Fridge and Freezer. 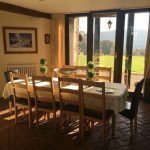 Plus adjoining dining room that looks out over the valley. 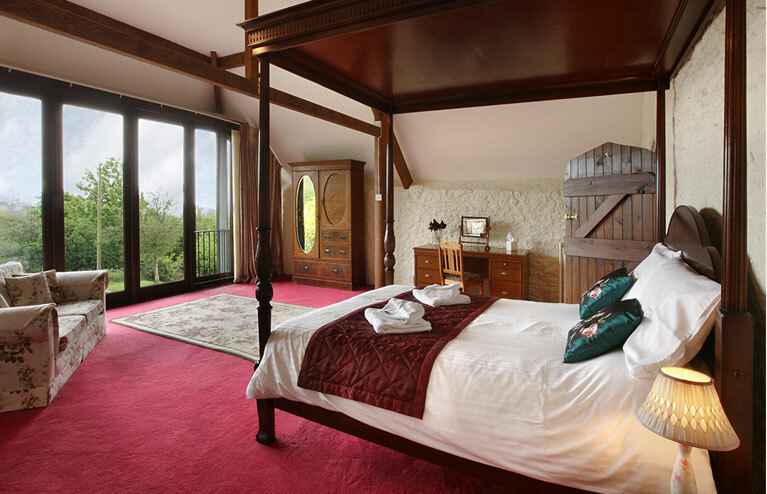 First floor – The large master bedroom has floor to ceiling windows with an impressive four poster bed and en-suite. 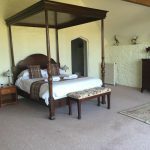 There are 2x additional bedrooms (1x double, 1 twin) all with en-suites. 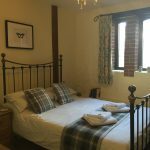 Ground floor – 2 x bedrooms (1 double, 1 large twin) shared bathroom. 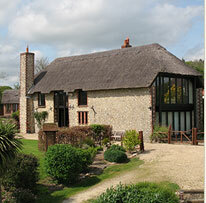 Private large, south facing garden and patio area with BBQ, seating and glorious views across the Dorset countryside. 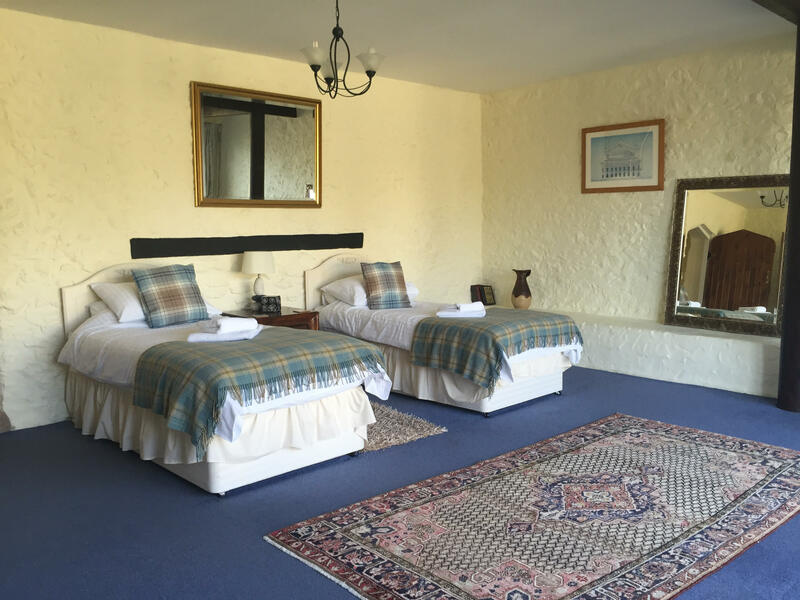 A further 2 single beds are available for the downstairs twin room, at an additional cost of £35 per bed. 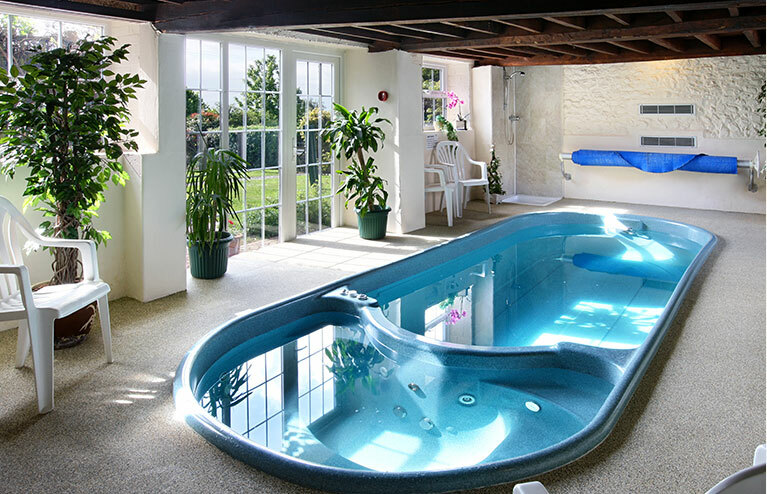 Start the weekend with a grand treat! 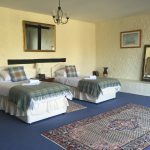 Wootton Fitzpaine, Nr. 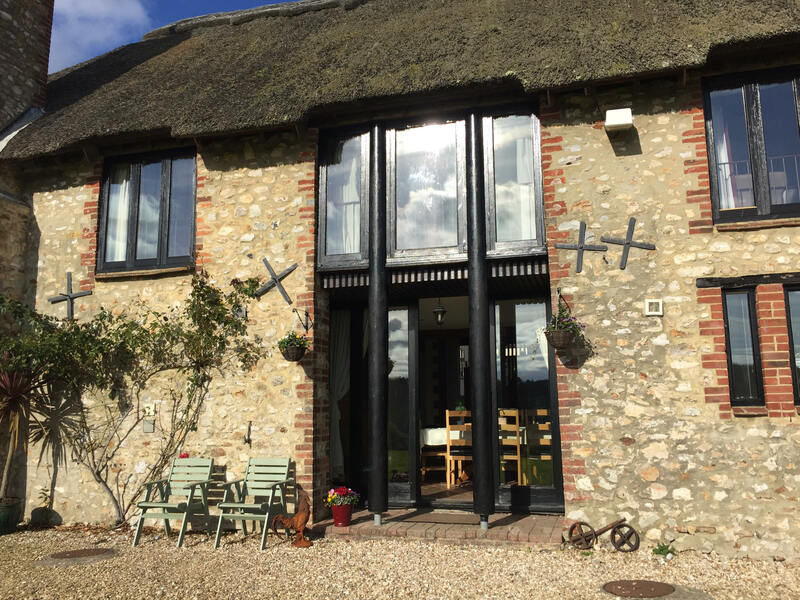 Lyme Regis, Bridport, Dorset, DT6 6DF.